The Down Uppity trail is located in the 18 Road Mountain Biking Area north of Fruita, Colorado. 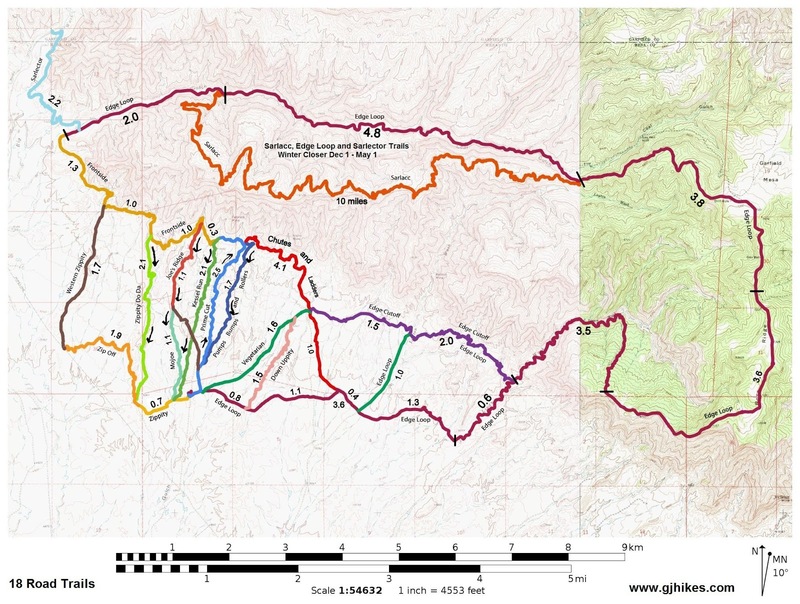 The 1.5 mile long trail runs along a ridge making a connection between the Edge Loop and the Vegetarian trails. 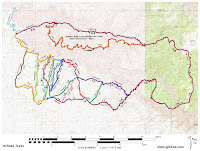 The Down Uppity trail can be combined with the Vegetarian and last leg of the 28 mile long Edge Loop to create a nice ~3.7 mile loop that would be great for a short hike, ride or trail run. This post follows the Down Uppity trail from the Edge Loop to Vegetarian. This point of the Edge Loop is about a half mile from the North Fruita Desert trailhead. There aren't much in the way of any obstacles on the trail. Just moderately smooth singletrack with a solid base for the most part. The first mile of the trail sticks close to the edge of the hill where it overlooks a small valley below that at present doesn't have any trails in it. This part of the trail has a slight uphill slope that is barely noticeable. About half of the elevation gain is split between the real gradual stuff as the trail heads away from the Edge Loop and a small hill that comes up later on. Here is what the trails profile looks like. The short distance the trail travels tends to exaggerate the size of the hill in the picture but you can see that about half of the elevation gain is in the part leading up to the hill. The trail can always be ridden in the opposite direction if preferred. Once the trail makes it up the little hill it continues in like fashion as before following above a lower valley. All too soon the trail comes to an end when it reaches the Vegetarian trail. From here it is about 1.4 miles to the trailhead along the left fork or 0.2 miles to the Chutes and Ladders trail along the right fork. We suggest printing out the map on the right or sending it to your phone to help in choosing your routes. If you send the Google map at the top of this post to your phone then you can track your position relative to the trails on the map. Pretty cool stuff. As far as the Down Uppity trail goes, if you would like to see it for yourself then all you have to do is grab your bike or 'Take a hike'.